Every Christmas I like to give handmade gifts for several reasons. ONE: We is po'. TWO: NOTHING compares to handmade. THREE: I'm pretty crafty so why not exploit my talents. FOUR: My family is narcissistic. HA! Scratch the last reason- I kid!!! So when I decided to paint everyone's portrait and give it a Victorian feel, it was a big hit. 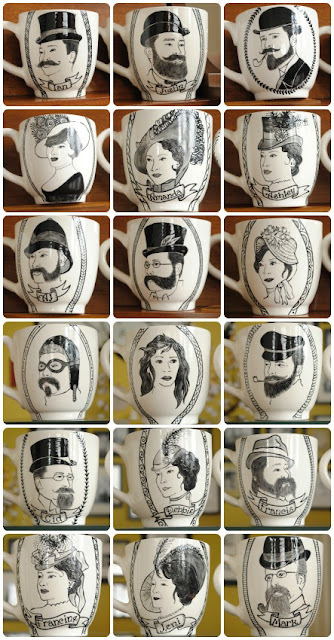 Since then I have been thinking about offering portrait mugs in the shop. I wasn't sure how the product would take, if anyone would be interested in something like this. Also the logistics of it all... the cost per ceramic, the paint, the firing and my time has to be accounted for and all priced accordingly. Until I got an email from a web-friend and pattern tester to my Miss Jenny Apron pattern, Rebecca. After seeing my mugs via Flickr and blog, she wanted one of her boyfriend for his birthday. Special requests: Victorian style, he has a fondness for cycling and is a HUGE fan of the Boston Red Sox. His family are big and I mean BIG fans, so much so the family built a 1/3rd scale Fenway Park on their property. Yes, you read it correctly. You can see how I work my magic on creating these mugs HERE. 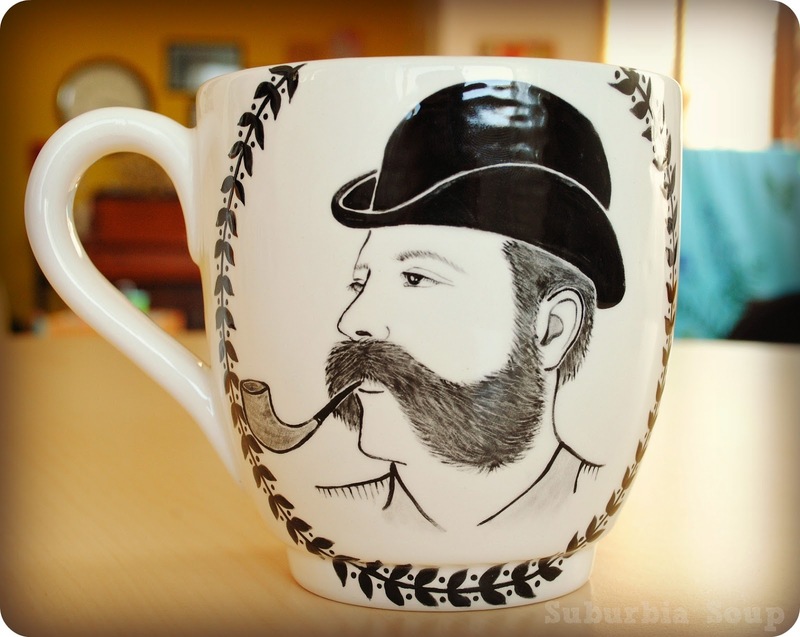 I have seen other ways of painting or transferring designs onto mugs or other ceramic pieces using sharpie pens and I have yet to try them out. If so, does it really work? SO the question still lies, should I sell custom portrait mugs? Thoughts? Ideas? I'd love to hear. P.S., Thanks Rebecca for letting me create something wonderful for you!!! 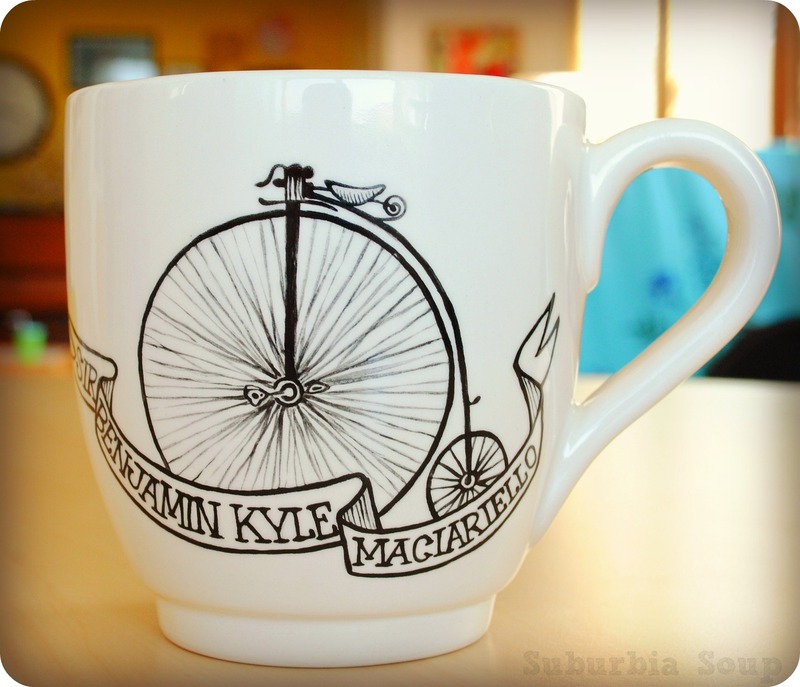 this is amazing, like the other 50 you made at christmas, and if you enjoy it, of *course* you should offer custom mugs! but only to the point you continue to enjoy it. Yes you should and you should charge a boat load. Seriously, this is a million dollar idea backed up with million dollar talent. I struggle with selling things for a high price because I think, I could never afford that. But these are one of a kind special and others (with fancy jobs or trust funds) will happily pay you top dollar! Awww, thanks Carla! Pricing accordingly can be a tricky thing and not to mention the right clientele. I should just do it and if it does't work out, I can always stop. Thank you, Yeka! It's pretty unique, I haven't found another one like it. I most definitely enjoy painting. I just need to stop thinking about it and just do it. these are really amazing. honestly. Make yourself available to make these for people and they will come get them. Plus, keeping supplies on hand to make the mugs is totally inexpensive! Thank you, Tara. Having the supplies on hand is key. FInding a safe place to store it in my little home, now that's another story! I think later in the summer, as we get closer to the holidays, I'll open it up. Just try it out and see if you like doing custom work. I agree with Yeka. 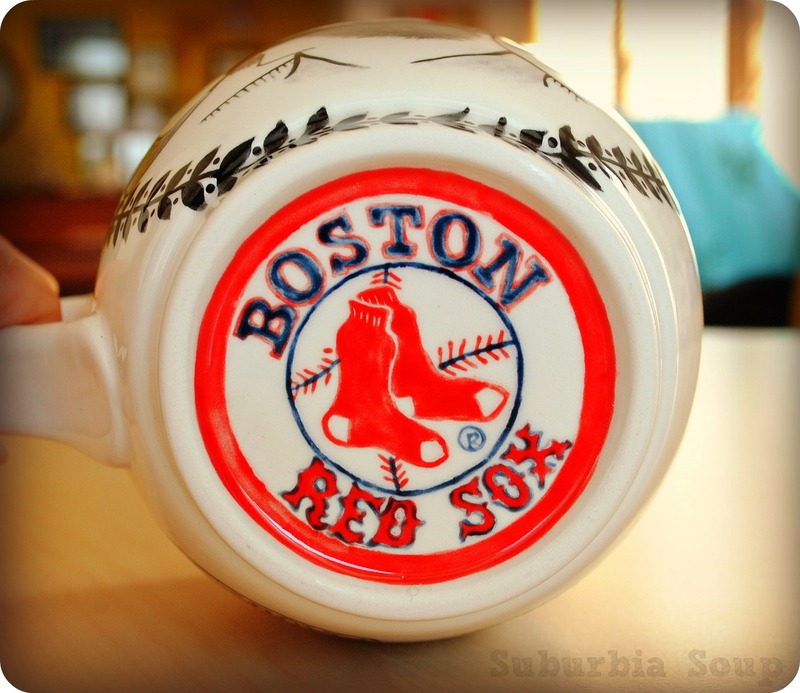 I love these mugs. LOVE them! I don't know what's wrong with me... I'm so scared to take that first step, but I've decided to give it a go, later as we get closer to the holidays.